The EU’s launch of negotiations for Deep and Comprehensive Free Trade Agreements (DCFTAs) with four Arab countries in transition – Egypt, Jordan, Morocco and Tunisia – looks set to entrench an economic model that was one of the root causes of the Arab Spring. Download the briefing. 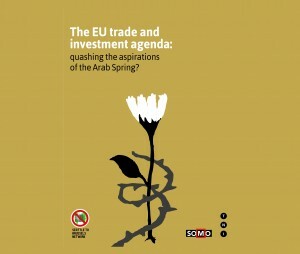 The EU, as their largest trading partner, should support the efforts of the Agadir countries (and the wider MENA region) towards more sustainable and equitable growth and development models, rather than facilitate closing down policy options by seeking to establish frameworks that allow transnational corporations and foreign investors to challenge political decisions in the public interest – essentially giving the ‘market’ will be as big a role in determining policy as the state. « BITs that bite into budgets: will the EP let private lawyers decide?